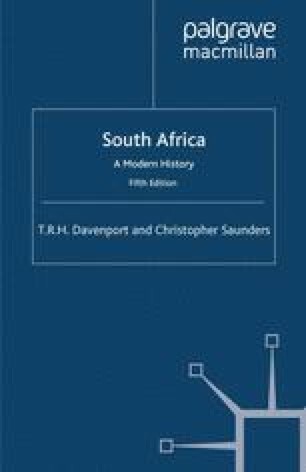 South Africa has provided a home for human settlement since very early times. The presence of homo sapiens goes back perhaps 125,000 years. These ‘first South Africans’, as Inskeep calls them, were followed much later by hand-tool makers of the Middle Stone Age, probably 40,000 years ago. Since the first arrival of human beings, the region has been occupied by small mobile groups of hunter-gatherers living in nuclear families which aggregated and dispersed in relation to ecological necessity, so as to manage food resources. Sites like the Klasies river mouth in the south-east Cape suggest the emergence of thinking people who appreciated colour symbolism through the use in their rock art of ochres perhaps acquired through exchange of goods.